Written by Kinoko Nasu, these specials are included in the BD box sets I & II. Join Irisviel as she helps Disciple No. Zero understand more details and history relating to the Holy Grail War. The Fate/Zero Counsel Specials are something that are to be watched after finishing the entirety of Fate/Zero, doing so otherwise may bring about confusion or spoil events to come. The story to these 6 specials is very simple, and is not the main focus to these more lightly-toned, comedic and 'educational' episodes. However, it was designed simply enough to be enjoyable so the viewer can enjoy the comedy while not being too lost in the hints towards the 'plot' of the specials, the over-arcing story of the main series, and the series that Fate/Zero Prequels, Fate/Stay Night. Overall, the story gets a 6; On its own it would leave much to be desired, but it fulfills its roll adequately, and giving the viewer a bit more than they would expect. The art is fairly similar to the main series, but lower quality animation for the most part. However, this less photo-realistic style suits this special quite well by having the familiarity of the main series while adapting a chibi-style for educational parts and allowing comedic expressions and elements while keeping that beautiful ufotable style. Overall, the art gets a 9 in my book; Keeping, for the most part, the high-quality character designs and backgrounds from the main series while sneaking in minor changes to fit the lighter tones of the special gives it high marks, but the directing style is a little lackluster. The sound design and soundtrack (the little that is used) is of equal quality to the main series, which was a surprise to me. It was a pleasant surprise as you might imagine, and the inclusion of some of the OST of Fate/Zero added that right atmosphere at the right times, and the general sound effects were high quality. The sound quality gets a 10; The high quality of the effects, the excellent performance of the Seiyuus and the inclusion and good timing of the main series's OST made the sound a very strong pillar of quality in this special. The characters for this part were a little bit tricky. Although similar in look to the characters we know from the main series, they also had to be altered a bit to fit in the more light-hearted and comedic style special. Only 4 servants appear, along with the mysterious student Zecchan and instructor Irisviel von Einzbern, but each of them were well crafted, having their own quips and contributions to the serious-humor of this special. However, since this series was very short, it did not leave much time nor leave much space for the characters to develop, only leap across points. With all that being accounted for, the Character part gets a 7; Good adaptations of the characters we knew into a lighter-toned mini-series, and a new character that has a good base, all of which complemented each other quite well. In all, this series is a very nice short series to watch after finishing the 2-cour Fate/Zero. However, if you are looking for something more akin to the tonality of Fate/Zero, it would be better to place those expectations asides while watching this. Fate/Zero: Onegai! Einzbern Soudanshitsu is mostly a somewhat comedic special that focuses on answering some possible questions you may have raised during the series, all the while explaining the troubles of a few of the characters from the main show. If you are looking to spend some time having a few chuckles, this special does deliver, even if you don't have questions about the Holy Grail Wars. In all, if you enjoyed Fate/Zero and had some questions and/or wanted to see a slightly more comedic take on a handful of its characters, then this is certainly something you could enjoy. 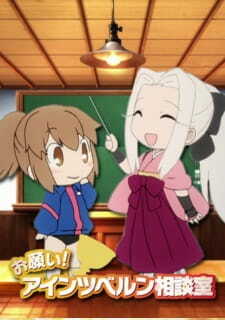 This anime is for those who have played the Fate/stay night VN, as it is very reminiscent of the Tiger Dojo. To be clear, the Tiger Dojo is the room that the FSN player ends up in when he chooses a bad ending in the VN. The Einzbern Soudanshitsu plays much the same role for F/Z. Story: The consultation room carries very little of its own story, instead relying on the parent work of F/Z for the story. It does help to fill in some missing information for the new-to-Fate series watcher, at least in the first 2 episodes, and even VN readers will discover a new thing or two. Having watched this after watching F/Z, I might suggest that this show can or even should be watched in line with certain of the Fate/zero episodes so that the watcher can create (partially) the same tone that FSN VN has when when the FSN reader hits a bad ending. While there may be some references which the watcher won't understand without having read the FSN VN or without having seen at least the FSN Fate and UBW paths in their entirety, I didn't see anything in particular which might spoil F/Z in particular episodes. Episode 1 can be watched any time after F/Z episode 1. Episode 2 can be watched after F/Z episode 4. Episode 3 is a little weird from a timeline perspective but should probably be watched after F/Z episode 4 or later. Episode 4 can be watched after F/Z episode 15. Episode 5 can be watched after F/Z episode 16. Episode 6 can be watched after F/Z episode 24. Art: The art resembles the "cheaper" art that one would find in the Tiger Dojo of the FSN VN, which when compared to F/Z is still nothing to scoff at. Animation wise, there is much less movement than in F/Z. Sound: The sound was merely good (I didn't notice it in particular). Character: I think this actually adds to the character of the involved parties. While it might not be canon, episodes 3 to 6 carry an interesting tone for each of the characters and aid in understanding what that character was thinking or feeling given the corresponding time period in F/Z. Enjoyment: I enjoyed it, given my general enjoyment of the Tiger Dojo. The consultation room is not however what many will expect tone-wise compared to F/Z, given that it does create a more similar atmosphere to Tiger Dojo. The tone in general is much lighter and may even cause laughter (shock) compared to F/Z.